At the Oaks, we take your pets’ health very seriously. 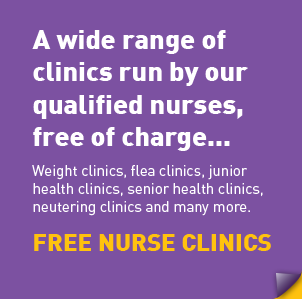 That is why we offer a wide range of clinics run by our qualified nurses, free of charge. FREE Junior Health Checks for animals aged 5-12 months. As well as a full head-to-toe health check, you will receive advice on all aspects of pet ownership as your pet heads towards adulthood. FREE Weight Clinics where your portly pal can be weighed and body condition assessed. We will discuss exercise and diet plans to help your pet achieve a healthy weight. FREE dental checks to examine your pet’s teeth and advise you on dental care and hygiene. FREE Senior Health Checks for animals over 8 years of age. Your pet will get a complete once-over and you will have the opportunity to discuss changes to your pet’s needs as they get older. FREE Rabbit Health Checks to ensure your hopper is healthy and you are doing everything to ensure a long and happy life. We are a bunny-friendly practice and our vet, Rebecca, and nurse, Stacey, have particular interests in rabbits. FREE Flea and Worm Checks to enable us to prescribe the best products to help eliminate those pesky parasites. If your pet has not been to see us in the last 12 months, this is a requirement before dispensing prescription medication. FREE Pre-operative and Post-operative Neutering Clinics to discuss your concerns and ensure your pet makes the most of life after neutering. FREE medication or worming administration for our clients- for when you are having trouble getting a tablet down or applying ear drops. For further information or to book an appointment, please call the practice or speak to a member of our reception team.